Crowell has signed a one-year deal with the Raiders worth up to $2.5 million, Adam Schefter of ESPN reports. Crowell is scheduled to visit the Raiders on Thursday, Ian Rapoport of NFL Network reports. Analysis: Crowell was released by the Jets at the beginning of the league year despite matching a career-high mark of 4.8 yards per carry during his lone season in New York. He essentially had three big games and 10 quiet ones, then missed the final three weeks of the season with a foot injury. Crowell would be a competent replacement for free agent Marshawn Lynch on early downs, though it's possible Lynch forgoes retirement and elects to return to the Raiders. 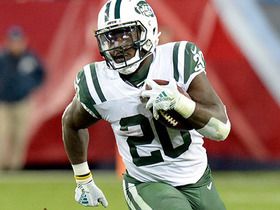 Crowell was released by the Jets on Thursday, Brian Costello of the New York Post reports. The Jets may move on from Crowell (toe) during the offseason, Matt Stypulkoski of NJ.com reports. Crowell (toe) was placed on injured reserve Friday, Brian Costello of the New York Post reports. Analysis: Crowell was already ruled out for Saturday's game against the Texans -- marking the first absence of his NFL career -- but will now miss the final three games of the season. The 25-year-old will finish 2018 with 143 carries for 685 yards (4.8 YPC) and two touchdowns while adding 21 receptions for 152 yards. Elijah McGuire should be first in line for backfield duties with Trenton Cannon also in the mix, though Cannon is questionable with a toe injury for Saturday's game. 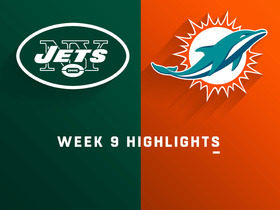 Crowell (toe) has been ruled out for Saturday's game against the Texans, Eric Allen of the Jets' official site reports. Analysis: With Crowell set to miss the first game of his NFL career, Elijah McGuire (ankle) and/or Trenton Cannon will work as the team's primary backs in Week 15. Crowell (foot) didn't practice Wednesday, Darryl Slater of NJ.com reports. 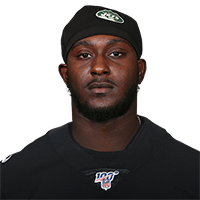 Analysis: Crowell's status for Saturday's game against the Texans thus remains muddled, but fortunately for the Jets, both Elijah McGuire (ankle) and Trenton Cannon (toe) returned to practice Wednesday after being listed as non-participants Tuesday. Added clarity with regard to the team's Week 15 backfield situation should arrive after Thursday's practice, the team's last session in advance of Saturday's tilt. Crowell (foot) wasn't spotted on the field for the portion of Wednesday's practice that was open to the media, Ethan B. Greenberg of the Jets' official site reports. Crowell (foot) was listed as a non-participant at Tuesday's practice, Darryl Slater of NJ.com reports. Crowell (foot) was not spotted during Tuesday's practice session, Brian Costello of the New York Post reports. Coach Todd Bowles said Crowell (foot) is feeling "pretty sore" Monday, Rich Cimini of ESPN.com reports. Crowell was forced out of Sunday's game against the Bills with a foot injury. 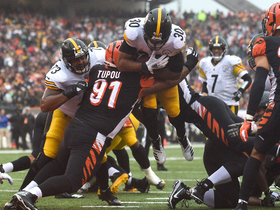 Analysis: Prior to his exit, Crowell had logged two carries for five yards and caught one pass for two yards. Elijah McGuire is next up for the Jets' carries while Crowell is sidelined. Crowell (toe) is active for Sunday's game against the Bills. Analysis: Crowell only managed one limited practice this week while contending with the toe issue that could be linked to the foot injury he battled through much of October. The prior concern didn't force any absences, and it doesn't appear that his latest issue will either. Crowell should fill his usual starting role out of the backfield, though his volume remains volatile on a weekly basis due to both game flow and the Jets' desire to give opportunities to second-year man Elijah McGuire. Crowell (toe), who is listed as questionable for Sunday's game against the Bills, is expected to play, Adam Schefter of ESPN reports. Analysis: Crowell missed the Jets' first two practices of Week 13 before logging a limited session Friday. If Crowell suffers a setback in pregame warmups or the Jets aren't convinced that he's close to full health, he could cede work out of the backfield to Elijah McGuire. Crowell (toe) returned to practice Friday as a limited participant and is listed as questionable for Sunday's game in Buffalo, Rich Cimini of ESPN.com reports. 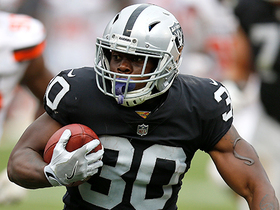 Analysis: Cimini believes the limited practice session puts Crowell on track to play, but certainty on the running back's status may not come until the Jets release their inactive list Sunday around 11:30 p.m. EST. An absence would leave Elijah McGuire as the leader of the Gang Green backfield, with Trenton Cannon providing depth. The Jets will probably sign a fourth running back by Saturday if they're truly worried about Crowell missing the game. Crowell (toe) was spotted with a helmet at Friday's practice, Ethan B. Greenberg of the Jets' official site reports. Analysis: Crowell didn't practice the last two days, but it appears he will be able to get some work in Friday. The Jets will reveal his status for their Week 14 game against the Bills at some point after practice concludes, but it was reported Thursday that a final call on his availability likely won't come until gameday. Crowell (toe) is trending toward being a game-time decision for Sunday's game against the Bills after missing practice again Thursday, Eric Allen of the Jets' official site reports. 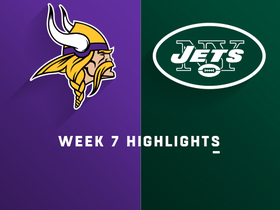 Analysis: Fortunately for those considering Crowell in Week 14 lineups, the Jets kick off at 1:00 ET on Sunday. If he's unable to play this weekend, Elijah McGuire and Trenton Cannon would be next up for the Jets' backfield touches. Crowell (toe) remained sidelined at Thursday's practice, Andy Vasquez of The Bergen Record reports. Analysis: Back-to-back missed practices set the stage for Friday's session to be pivotal with regard to Crowell's status for Sunday's game against the Bills. In the event that he is limited or sidelined this weekend, Elijah McGuire and Trenton Cannon are next up for the Jets' backfield touches. Crowell didn't participate in practice Wednesday due to a toe injury, Rich Cimini of ESPN.com reports. Crowell rushed 21 times for 98 yards and caught four of five targets for nine yards in Sunday's 26-22 loss to Tennessee. Crowell garnered 30 yards on six carries and caught three of four targets for 30 more yards in Sunday's 27-13 loss to New England. Analysis: Crowell's lack of volume is puzzling given that this game was tied 13-13 with two minutes left in the third quarter. His stats are bolstered by a 219-yard outburst against Denver, but Crowell has been held to fewer than 50 rushing yards in all but one other game this season. Expect Crowell and Elijah McGuire -- who also got six carries in this one -- to split work against the Titans in Week 13. 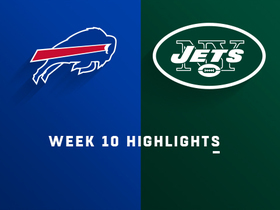 Crowell rushed seven times for 19 yards and a touchdown while catching both of his targets for 18 yards in Sunday's 41-10 loss to the Bills. Analysis: Despite his ugly performance, Crowell was easily New York's best fantasy player here by virtue of scoring the team's lone touchdown. Still, he was bottled up outside of that 5-yard score and an 18-yard run. Elijah McGuire and Trenton Cannon combined for 10 carries themselves, so Crowell's workload is looking quite shaky heading into the Week 11 bye. Crowell gained 49 yards on 13 carries and caught one pass for 11 additional yards during Sunday's 13-6 loss to the Dolphins. New York Jets running back Isaiah Crowell bounces outside for 27 yards on the rush. 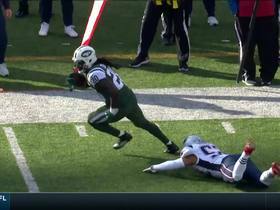 New York Jets running back Isaiah Crowell's filthy open-field move makes New England Patriots linebacker Elandon Roberts miss on 19-yard catch-and-run. 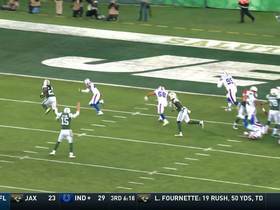 Buffalo Bills running back Isaiah Crowell runs in 5-yard touchdown. The "NFL Fantasy Live" crew discusses players you should move into your lineup from your bench or the waiver wire. 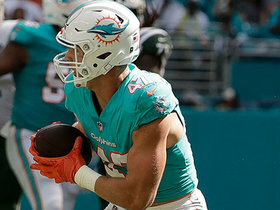 NFL Media Senior Fantasy Analyst Michael Fabiano discusses the five players that really surprised him during Week 6 of NFL action. 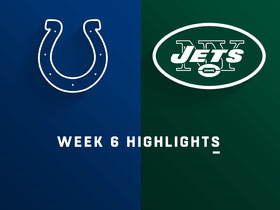 Watch the highlights as the Indianapolis Colts take on the New York Jets in Week 6.